Los Angeles Police Officer Randal (Randy) Simmons became the first member of the Los Angeles SWAT (Special Weapons and Task) Unit to die in its 27-year history when he was shot and killed as he and other members of the SWAT Team made entry into a home at approximately 12:30 am., Thursday, February 7th, following a tense overnight standoff. The team had been deployed to a home in Winnetka after a suspect inside called 911 and claimed to have murdered three family members. As the team entered the San Fernando Valley home believing there to still be wounded victims inside, the suspect opened fire striking Officer Randy Simmons in the head and wouding Officer James Venestra, another member of the SWAT Team. Both officers were immediately transported to Northridge Medical Center in Los Angeles, where Officer Simmons succumbed to his wounds approximately 30 minutes later. The second officer, a veteran member of the tactical team who was cited for valor in 1997 for his actions at the scene of a shooting that left a Glendale police detective dead, underwent surgery and was expected to survive. Officer Simmons, age 51, had served with the Los Angeles Police Department for 27 years and had served with the SWAT Unit for 20 of those years. He was described by his former partner, Los Angeles Police Captain James Craig, as being "Passionate about the job and passionate about making a difference in the community". Officer Simmons is survived by his wife, a son age 15, a daughter age 13, his parents, and three sisters. 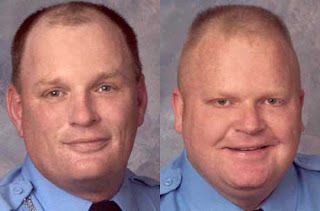 The lives of two more Law Enforcement Officers were taken after an unfathomable tragedy struck the town of Kirkwood, Missouri, a suburb of St. Louis, on Thursday, February 7th when a gunman with a history of acrimony against the town's civic leaders opened fire during a council meeting. The shooting spree killed two police officers and three others before the gunman was fatally shot by Kirkwood police officers. Sergeant William Biggs was fatally shot in the head while in the parking lot of the Kirkwood Police Department across the street from city hall when the suspect approached him and asked what time the meeting started. The suspect then took Sergeant Biggs' service weapon and walked across the street into city hall where he approached Officer Tom Ballman who was sitting in the front of the room and fatally shot him in the head also. The man then opened fire on the other people in the room killing two council members and the director of public works before being shot and killed by two other police officers. As of this writing, I had no further information on age or length of service for either Sergeant Biggs or Officer Ballman but I am sure that they were both well-respected members of their department and will be sorely missed. Please keep the families of Officer Simmons, Sergeant Biggs, and Officer Ballman in your thoughts and prayers as well as their fellow department members. Both communities have suffered devastating losses and these senseless tragedies need to stop!